Join us this Thursday, June 28th from 7-10pm at Satellite Project Space for the closing reception of our summer workshops and residences. Come and see the collaborative Print Garden installation! This weekend, Tania Love will be presenting the third workshop in Print London's summer program, The Print Garden. Participants will learn how to cut and manipulate (printed) washi into 3D forms as part of a collaborative art installation. Tania Love is a Toronto based visual artist who takes the cues for her work from the natural and cultural environment. Recipient of numerous grants, international residencies and exhibitions, her work has been seen in public and commercial galleries, popup vitrines and design projects across the globe from her native Toronto and Ontario surrounds, to NYC, France, Poland, Japan and India. In the past year her work was featured in the Toronto Offsite Design Festival at the Craft Ontario Gallery and at Alison Milne Gallery in Toronto. In recent years Tania's art practice has evolved as a direct response to place, where the season, the palette, natural forms and cultural context have all figured in the realization of specific works. From marbling paper, to hand cut lacework, braiding reclaimed wire, plant tannin prints and cyanotypes, her work nods to traditional processes and expresses innovative outcomes. With a keen interest in the materials she explores, she look towards creating pieces that invite slower rhythms and encourage tactility and relationship to natural cycles. There are still a few places left in this workshop. Participants will be working with prints made in previous workshops to help build the collaborative art installation at Satellite Project Space. Print London is hosting a summer program of printmaking workshops and artist residencies which will explore Japanese papers “washi” as both a surface for printmaking and as a sculptural material. 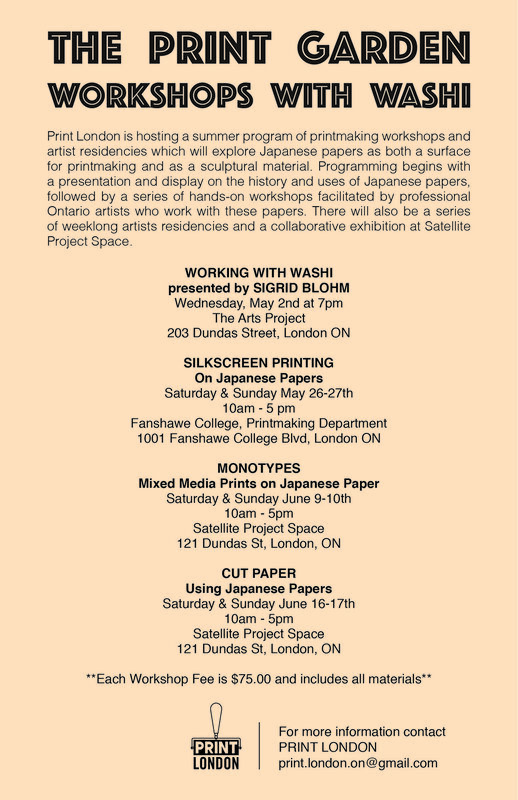 Programming begins with a presentation and display on the history and uses of Japanese papers, followed by a series of hands-on workshops facilitated by professional Ontario artists who work with these papers. There will also be a series of week-long artists residencies and a collaborative exhibition at Satellite Project Space in June 2018. Come out Wednesday, May 2nd for this fantastic lecture by Sigrid Blohm of the Japanese Paper Place. The event starts at 7pm, and will be held at The Arts Project! Print London is having a fundraiser and we would LOVE for you to come!!! Join us Thursday April 26th at Winks for a night filled with prizes, silent auctions and DJs. All proceeds raised will go towards Print London's summer programming of printmaking workshops and residencies for local artists titled The Print Garden. Print London was proud to host Eric Mummery at Satellite Project Space June 29th as both a longstanding member and first prize winner our three jurors selected for the TOMPE 2017 exhibition. He gave a survey of his works in both lithography and wood engraving as well as a history of his printmaking experiences at NSCAD and residencies at Trois-Rivieres, Quebec. Thanks so much to Eric and everyone who came out! Click here for our Facebook page and more details. TOMPE 2017 was a huge success! There is too much to talk about in this news feed so we set up a whole page with pictures, our winners and catalogues for sale! [Click Here] to take you there. Tara Cooper's presentation at The Arts Project. Print London was visited by artist Tara Cooper who gave a wonderful talk at The Arts Project on Saturday May 27th 2017. She showed her collection of limited edition hand printed books and other print ephemera. Thanks to Tara, everyone who came out and The Arts Project. For our spring Artist Talk series we are excited to be joined by Tara Cooper who will be giving a talk originally presented in Portland at the Southern Graphics Print Council Conference. Cooper's work combines outcomes of print, found objects, sculpture, text and video with installation. Her presentation explores the process of handmade printing where glitches, malfunctions, and imperfections challenge the slick perfection of print's industrial counterpart. Cooper is an Associate Professor of Fine Arts at the University of Waterloo, Department of Fine Arts. She is also the co-editor of Printopolis - a recent publication that examines contemporary print culture. Please visit our Facebook page for more details. The Grand Theatre is generously offering discounted tickets on certain performances of Art to our members and supporters! So come on out and see the performance! In the lobby you can also see amazing works from local artists, including four from the Print London collective: Lori Jensen-Brazier, Eric Mummery, Cindi Talbot and Matt Trueman. This Tony award-winning masterpiece, directed by Nigel Shawn Williams, explores the idea of what, if anything, defines art - and friendship. Get 25% off your tickets for Art! Our TOMPE 2017 Fundraiser was a huge success! Many thanks to everyone who donated, supported and came out to Print London's first fundraiser. The evening was a huge success. Thank you to the generosity of everyone in the community, Print London can continue to develop programming for our annual event, The Ontario Miniature Print Exhibition (TOMPE2017). A huge thanks to Wink's Eatery for hosting the event and providing delicious food and drinks. We want to acknowledge and thank our venue, door prize sponsors and entertainment. Yessica Woahneil performing at Winks for Print London's TOMPE 2017 Fundraiser. Get your door prize raffle tickets for only $10! Tickets available online from EventBrite [Click Here]. For full event information visit our Facebook page by clicking the ticket above or [Click Here]. A kind thanks to everyone who came out to The Arts Project and especially Laine Groeneweg (in red) who drove from Hamilton for the occasion. His stunning mezzotint prints and stories of their creation made the hour talk fly by. In the new year Print London will be organizing a trip to visit Laine in Hamilton and tour his Smokestack Studios. Finally, thanks to The Arts Project for hosting the event. Visiting artist Laine Groeneweg will be giving a talk at the next meeting November 23rd. Our next meeting is coming up on Wednesday November 23rd at 7pm at The Arts Project. You are not going to want to miss this meeting, as we have invited Hamilton printmaker Laine Groeneweg to come and talk to us about his work. OMIT I will be sending another reminder closer to the date. Please Invite anyone that you think would be interested. Laine Groeneweg is a printmaker currently living in Hamilton, Ontario. He received his BFA from York University in 2004 and subsequently trained as a professional printmaker at Fondazione Il Bisonte Per Lo Studio Dell’Arte Grafica in Florence, Italy. Laine is most widely recognized for his work in mezzotint and etching and exploring the possibilities of traditional technique in the wake of more contemporary production methods. His whimsical imagery is often characterized by themes of dream and play. His prints have been exhibited nationally and internationally in Canada, Australia, Russia, Japan, Finland, Italy, Taiwan and the United States. Print London celebrates our second birthday! Thanks to all the members and visitors who came out to celebrate Print London's second birthday on October 19th 2016. Some of the members of Print London who attended the annual meeting. September 17th: Kurt Pammer drove from his Toronto home to London to give a wonderful talk about his work and winning print at Satellite Project Space. This talk was part of the programming for Dundas Street Fest. This was the first project in what we hope to continue as an ongoing collaboration with Toronto's Open Studio. Have a look at the TOMPE 2016 page for full coverage! Print London had a great installation on Dundas Street beside Budwieser Gardens. The theme was called Phantom Impressions and featured a 60 foot fabric path with over 50 different footprints and designs for people to try printing. However, as the sun dropped and the huge black lights and christmas light decorated tents began to glow the dark clouds overhead responded. Unfortunately right as night got into full swing the rain began. Thankfully we were able to get some great photos - even if it's more blanche than nuit. Many thanks to our volunteers who helped with the event!